Girl Boss Championship Award Belts Series. These Girl Boss belts are made to recognize badass women in the workplace! 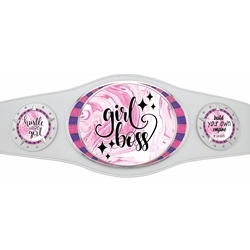 Our new "Girl Boss" Champion belt is sized for a big winner with a smaller size. These belts can fit up to women's size 10 but also make a great artwork piece for your wall or desk. Create your own award belt has endless possibilities for creating a truly customizable award that will be a showstopper. Belt is made of vegan leather and is 40" long with easily adjusted Velcro closure. The large 8 ½”x 6" brightly finished metal oval plate features dazzling glitter enamel and is complemented by two 3 1/4" round side plates. Available in white vegan leather belt with bright silver plating with purple and pink glitter. Comes complete with a black velvet pouch for the perfect presentation.